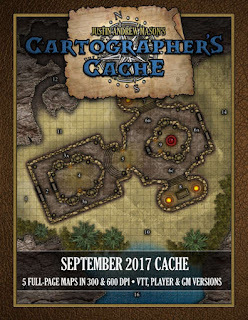 My previously free PDF map series Cartographer's Cache has been retooled to serve as the wheelhouse marketplace for my VTT Maps Patreon. In turn, a new regular series of free map releases is planned for the near future through a new venue currently being negotiated with a publisher. A new volume to this series will be added monthly including all maps released via my Patreon for the relvant time-frame. The number of maps included in each volume is indicated on the front cover, but will fluctuate depending on the funding status of my Patreon account. There will be at least 4-5 maps in a volume (Saturday map releases), but the number per volume could grow to contain many more depending on Patreon goals. The price for a volume of Cartographer's Cache will remain $7.99 ($2.99/month more than current top-tier patrons pay). Click here to see what Cartographer's Cache volumes are currently available.